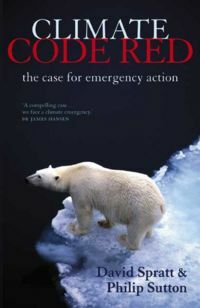 Climate Code Red: The Case for Emergency Action is a 2008 book which presents scientific evidence that the climate change and global warming crisis is worse than official reports and national governments have so far indicated. The book argues that we are facing a "sustainability emergency" that requires a clear break from business-as-usual politics. The authors explain that emergency action to address climate change is not so much a radical idea as an indispensable course we must embark upon. Climate Code Red draws heavily on the work of climate scientist Dr. James Hansen. "Our goal is a safe-climate future – we have no right to bargain away species or human lives." "We are facing rapid warming impacts: the danger is immediate, not just in the future." "For a safe climate future, we must take action now to stop emissions and to cool the earth." "Plan a large-scale transition to a post-carbon economy and society." "Recognise a climate and sustainability emergency, because we need to move at a pace far beyond business and politics as usual". 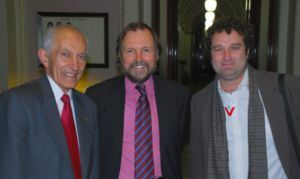 Author David Spratt is a Melbourne businessman, climate-policy analyst, and co-founder of the Carbon Equity network. Co-author Philip Sutton is convener of the Greenleap Strategic Institute and president of the Sustainable Living Foundation. 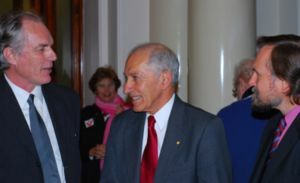 The Governor of Victoria, Professor David de Kretser, A.C. launched Climate Code Red in Parliament House in Melbourne, Victoria, on July 17, 2008. At the launch, Professor David de Kretser said "There is no doubt in my mind that this is the greatest problem confronting mankind at this time and that it has reached the level of a state of emergency." This page was last modified 12:41, 12 January 2013. This page has been accessed 41,496 times.